This one-of-a-kind collection consists of a variety of objects in contemporary and traditional forms. 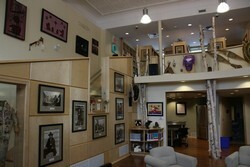 Items are on display in our main space and also throughout the building. Drop in or book a tour to check out some of our amazing items!